While little is known about Apple’s flagship smartphones arriving next year, it’s rumoured that there will be three devices, each of which take after the premium iPhone X. This includes swapping out the previously used LCD screens for an OLED display. Apple’s impending models due for release later this year are slated to vary its displays, with reports suggesting that the two more expensive, higher-end variants, dubbed the second generation iPhone X and iPhone X Plus, will sport the premium technology. It’s cheapest option, however, will keep the same 6.1-inch display, opting for an LCD panel instead. 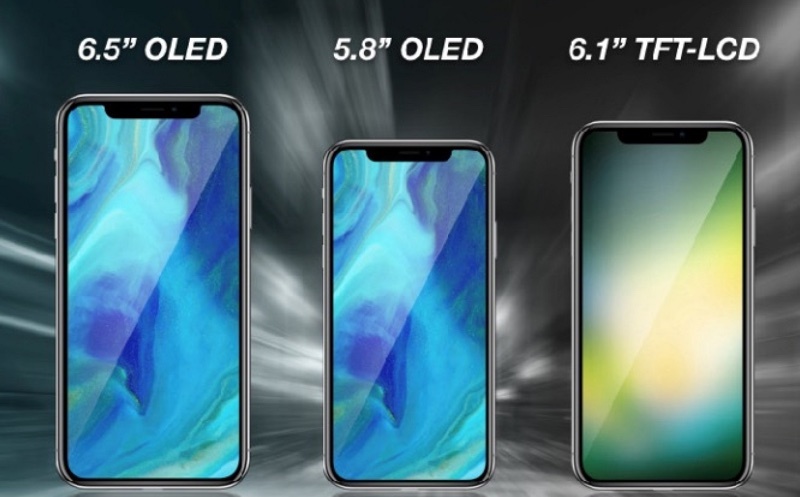 This is all set to change by 2019, when Apple will reportedly complete its full transition to OLED, with all three of its flagship models utilising the technology, according to South Korean publication Electronic Times. Image: Apple’s rumoured 2018 line-up. Whispers of the transition have been circulating for quite some time, matching Apple’s current progression in display technology. Unfortunately, the widely publicised rumours have caused the shares of the company’s current display provider, Japan Display, to fall by 20 percent. This has since stabilised to a 10 percent drop, while rival manufacturer Sharp is down just 4 percent. Samsung has taken over the duties as the sole display provider of the iPhone’s OLED panels, however this is set to change after Apple has made an investment in LG to catch up with the tech. LG will reportedly be providing the company panels for the larger iPhone X Plus. KitGuru Says: LG have already had setbacks when handling OLED panels with Google’s Pixel 2 XL. It will be interesting to see if Apple’s investment will make a difference in the company’s quality control.